For complete information about the OTM license, please click here. OTM supports project managers in their project budgeting. The agency administrator sets his/her own agency’s project budgeting calculation basis in the OTM administration section. This procedure has the advantage of taking into account different parameters that affect the sales price in the determination of the purchase price. For example, a source file in PDF instead of Word format can generate additional processing work, or the customer’s desired weekend turnaround may involve a higher fee on the part of the translator. In other words: Higher customer prices trickle down to improve translator remuneration. At the job offering stage, the system automatically shows the PM the freelancer’s fee computed according to his/her agency’s calculation parameters. This is only a guideline; in actual fact, fees can of course be adapted by the Project Manager to each individual case. Years of practical experience have proven that this procedure has decisive advantages. Freelancers develop the positive perception that fees per word are not always the same but that they may sometimes also be higher (e.g. because the agency may have been able to negotiate a higher price with the customer). Of course the reverse conclusion is that freelancers will occasionally also accept lower fees (because the agency may have granted the customer a discount in order to obtain the job). Calculations must in any event be handled with care. Agencies cannot endlessly grant discounts to customers and try to make up their margin by dipping into the translator’s share. This would most likely quickly lead to freelancers no longer taking on that agency’s jobs. For all OTM users, the goal is to develop balanced and overall equitable relationships also in regard to fee arrangements in order to live up to the networks motto of “Fair Play”. Fast, uncomplicated, and transparent project management add up to a distinct competitive advantage. Working in the Quality Translation Network enables busy language service providers to save a great deal of time at the project processing stage while sustainably raising quality of service. How is it possible to save time in the management of a translation project and increase quality at the same time? Shortening support and administrative processes allows the time saved to be used for actual translation and quality control tasks. The OTM network software supports this approach with special workflow and QA modules. The project manager receives a customer inquiry and announces a potential job to various freelancers, asking about availability, pricing, etc. Then, he or she waits for their answers, and only then can a proposal be drawn up for the client. Each freelancer may have to look at documents and answer the inquiry even though it is not certain that the job will later actually be assigned to him or her. The customer will get a proposal only once the freelancers have submitted their offers and at least one of them has confirmed availability. The entire procedure represents a great deal of unnecessary effort and/or waste of time for all parties involved. Also, if the client’s order comes in later than at first assumed, for example, the translator to whom the job had been promised may already have accepted other assignments in the meantime. And, as ultimately only one freelancer can actually get the job, polite project managers then have to notify all the other translators contacted. The project manager develops his client proposal directly after receiving the customer’s inquiry. As soon as he or she receives the customer’s order, the project manager releases a job offer to his/her own agency’s freelancers (Agency Resources) or to freelancers within the network (Network Resources). Freelancers receive a binding, fixed price job offer from the agency. All necessary information is included in the job offer. They can examine the files to be processed on their OTM service pages and decide whether to accept or decline the job as offered. If the answer is “yes”, the freelancer can start work straight away. If the job offer is released to several freelancers, acceptance is on a “First-come, First-served!” basis. The client gets his proposal extremely quickly – depending on the PM’s workload and the project’s complexity, generating an offer will take around an hour, but usually no more than two. The traditional procedure is generally used because the agency is not certain of the pricing at which it should offer the project to the customer, or whether an appropriate translator is available. Therefore, it is necessary to set up all kinds of safety nets, which is a cumbersome exercise that becomes possible only with significant amounts of effort. 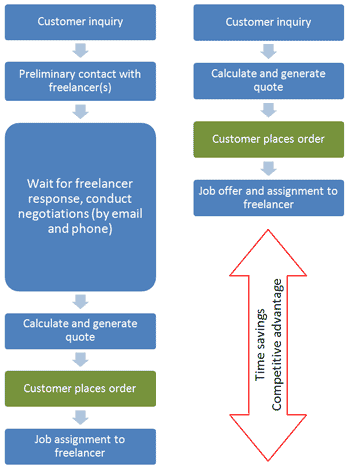 Most language and subject combinations are covered by the agency’s own or the network’s freelancer pool. The project manager automatically receives system suggestions for appropriate freelancers when preparing the job offer. With the OTM database, the PM can also, if in doubt, request a display of the potentially appropriate freelancers to get an idea of their availability before formulating the client offer. The freelancer profiles show each freelancer’s “standard rates”. This is particularly useful when calculating the cost of language and subject matter combinations that are new for the agency. The same job can be offered to any number of suitable freelancers at once. Once a freelancer has accepted the job, all others receive a notification that the work has already been assigned when they log in to their OTM service pages. Over time, this feature results in a desirable side effect, as freelancers will check their email more frequently, thus considerably reducing reaction times. However, addressing more than three freelancers at a time is advisable only for very urgent jobs, as only one can be assigned the work, and “missing the job” can generate disappointment in the others. Moreover, after a certain amount of experience with the OTM workflow project managers will often know in advance who is likely to accept a given job, so that they can, if appropriate, offer it to just one person. If that freelancer does not react, the project manager can notify others in just a few mouse clicks.